Thank you for your interest in AMVETS NSF. I am interested in obtaining an American flag. How can I? Our most popular type is an American-made, 3’X5′ all-weather nylon flag with double-stitched stripes and embroidered stars. They are a wonderful way to show your patriotism. We have several donors who return again and again for flags as retirement, wedding or Christmas gifts. This flag is available to you in exchange of a donation of at least $30. Mail a check payable to AMVETS National Service Foundation 4647 Forbes Boulevard, Lanham, MD 20706. Can you help me determine proper flag etiquette? Our Flag Etiquette brochure can answer all of your questions from how and when to display “Old Glory” to how to dispose of flags properly. I would like to know where I could make a clothing or household item donation. I am also wondering what kinds of items you accept. We have sites across the country that either offer pickup services at your convenience, or offer a drop-off location at one of our thrift stores. Go to our thrift stores page for a convenient location near you. What happens to my clothing and household donations? Your donations are picked up and taken to thrift stores. Our thrift stores sell them to the general public. The proceeds go toward providing programs and services for our veterans. Where can I obtain a receipt for my thrift store donation? Call your local pickup service and they will mail one to you. You can find a phone number for your local pickup service on our thrift stores page. I would like to make a monetary donation to AMVETS to support all the work you do for our veterans. Simply go to our donations page and enter your credit card information. You also have the option of mailing a check made payable to AMVETS National Service Foundation P.O. Box 96175 Washington, DC 20090-6175. How do I donate my car, truck, boat or airplane to AMVETS? Go to our donations page and click on the Vehicle Donation Program icon. Either fill out donation information online or call the toll free number provided to speak to someone. Are there other ways can I support AMVETS? Speak to your Human Resources Department to see if your company offers a Matching Gifts Program. If so, you can double the monetary gifts you give to AMVETS National Service Foundation by simply filling out a form provided by your employer. This is no extra cost to you. Also, AMVETS has a Planned Giving Benefits Program where you can donate a substantial gift to AMVETS and receive tax deductions. Call Doug Petersen at 888-781-0916 for full details. The eBay Giving Works program gives eBay sellers the opportunity to ramp up their sales opportunities by bragging to potential buyers that they are designating a portion of each sale to AMVETS Charities, Inc. A charity icon is displayed next to each item for sale to let buyers know that you support our nonprofit organization. Make GoodSearch your search engine of choice. Then designate AMVETS as your designated charity. There is absolutely no cost to you and you’re helping veterans by simply using their search engine! How can I enroll my deceased loved one in the AMVETS Memorial Carillon Registry? Simply fill out the Memorial Carillon Enrollment Form. You will receive a nice certificate to show their enrollment. Please note that although we fund numerous carillons nationwide, carillon bells will only toll at our Headquarters on the requested date and time. How do I arrange a funeral with military honors? 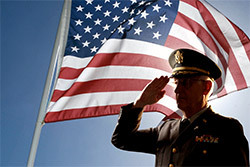 Go to the Military Funeral Honors website. How can I have my name corrected or removed from your mailing list? Just e-mail your correction or removal request to through our contact form and you will receive prompt attention. I am interested in working for AMVETS. How can I get involved? I still need a question answered. Who can I contact? Please call toll free at 800-810-7148 or use our contact form.